Sulwhasoo's Snowise Brightening Serum was launched earlier this year as an addition to Sulwhasoo's already very successful Snowise skincare range, which is a whitening range (as you might guess from the name). Sulwhasoo is a niche, high-end skincare brand that hails from Korea, with a focus on "holistic beauty" that is "inspired by Asian philosophy", which in their skincare line, means the use of plant extractsa nd ingredients that are traditionally used in Asian cultures. If Sulwhasoo's Snowise Brightening Serum sounds slightly familiar, it's because previous iterations of the same product have been released. This version, according to parent company AmorePacific, is the "advanced eighth-generation" version, with "enhanced white ginseng extract, moist and smooth finish and a new packaging design". A whitening serum, punched up one level - what's not to like? Sulwhasoo opened a store in Singapore last year, and since then it's been getting quite a lot of buzz. Furthermore, the kbeauty trend is still a pretty hot one right now, and so I was quite keen to review this product. 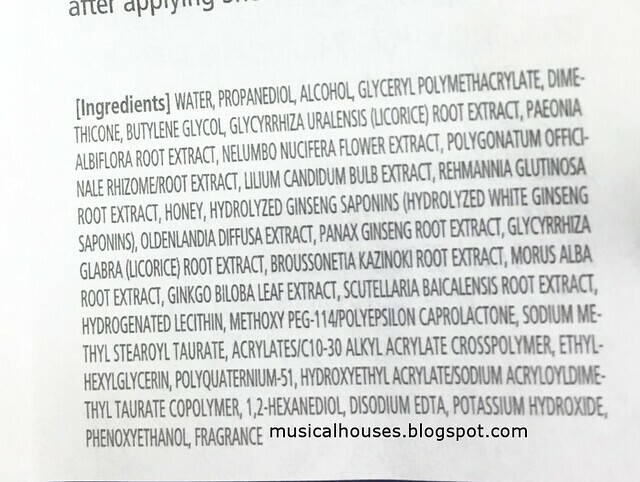 So, without further ado, let's take a look at the ingredients list, and begin our review! The ingredients in the serum are Water, solvents (Propanediol), Alcohol, which aids the penetration of the product, film formers (Glyceryl Polymethacrylate), silicones (Dimethicone), and humectants (Butylene Glycol), which make up the base of the product and give it a lightweight, fast-absorbing and lightly moisturizing properties. Then there are also a number of plant extracts and plant derived ingredients (Licorice Root Extract, Paeonia Albiflora Root Extract, Nelumbo Nucifera Flower Extract, Polygonatum Officinale Rhizome/Root Extract, Lilium Candidum Bulb Extract, Honey, Hydrolyzed Ginseng Saponins, Oldenlandia Diffusa Extract, Panax Ginseng Root Extract, Licorice Root Extract, Broussonetia Kazinoki Root Extract, Morus Alba Root Extract, Ginko Biloba Leaf Extract, Scutellaria Baicalensis Root Extract). These will obviously please consumers who like plant-derived ingredients - there are 14 of them here to be exact. One of Sulwhasoo's selling points is the use of plant extracts that are found in traditional Asian preparations, and the list of plant extracts does live up to its expectations in this regard, with ingredients Ginseng, Peony, Ginko Biloba, Rehmannia Glutinosa, Polygonatum Officinale, Morus Alba, Scutellaria Baicalensis, and so on being previously used in various Chinese, Japanese and Korean medicines, foods or other herbal preparations. The plant extracts serve a variety of purposes, and as with most plant extracts, the body of science research behind them is varied - some ingredients have a pretty decent amount of published studies attesting to their skincare benefit, but some have just a couple of supplier brochures or trade news reporting and not much else. Still, it's better than nothing! 3) those with whitening properties (Nelumbo Nucifera Flower Extract, Lilium Candidum Bulb Extract, Morus Alba Root Extract), and so on. .
One last thing about the plant extracts in the Sulwhasoo Snowise Brightening Serum. I really liked that the extracts, for the most part, seem to be useful to skin, even if there isn't all that much available published research on them, and I particularly liked that the plant extracts used aren't just irritating fragrant oils. Quite often, a skincare product may advertise "natural ingredients", but if its natural ingredients are just things like citrus oils, or menthol, or lavender oils, these ingredients can actually be pretty damaging to skin even if they sound "natural". For example, these ingredients can cause sensitivity or allergic reactions, or in the case of citrus oils, increased photosentivity, but not actually contribute anything else skincare-wise. Fortunately for the Snowise Brightening Serum, the ingredients are actually ones that are chosen to be helpful and have some skincare benefit (anti-oxidant, anti-aging, brightening, etc. ), and aren't as likely to irritate or sensitize skin. So it's nice to know at least these plant extracts are helpful, and not just cynically thrown in there for marketing purposes. After the plant extracts, the last few ingredients in the product are various functional ingredients including emulsifiers (Hydrogenated Lecithin), polymers (Methoxy PEG-114/Polyepsilon Caprolactone), thickeners (Sodium Methyl Stearoyl Taurate, Hydroxyethyl Acrylate/Sodium Acryloyldimethyl Taurate Copolymer), film formers (Acrylates/C10-30 Alkyl Acrylate Crosspolymer) preservatives (Ethylhexylglycerin, 1,2-Hexanediol, Disodium EDTA, Phenoxyethanol), pH adjusters (Sodium Hydroxide), and Fragrance. So with that, we round out the ingredients analysis part of the review. And now that we've looked at the ingredients in the product, how does the product actually function on the skin? 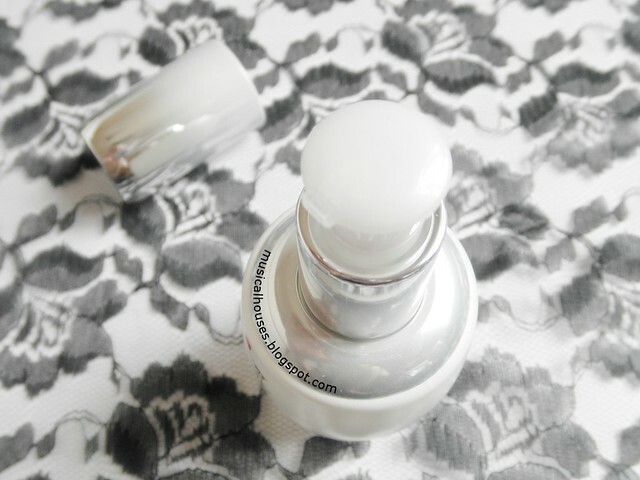 When applied, it is a white, transluscent gel, as you can see from the photo above. And just as I expected from the formulation, it has a very lightweight finish, and absorbs fast into the skin, without leaving any residue. It also had a scent that I would describe as part-ginseng, part-floral. I found this to be a nice, easily layered serum, that worked well with other products in my regime. 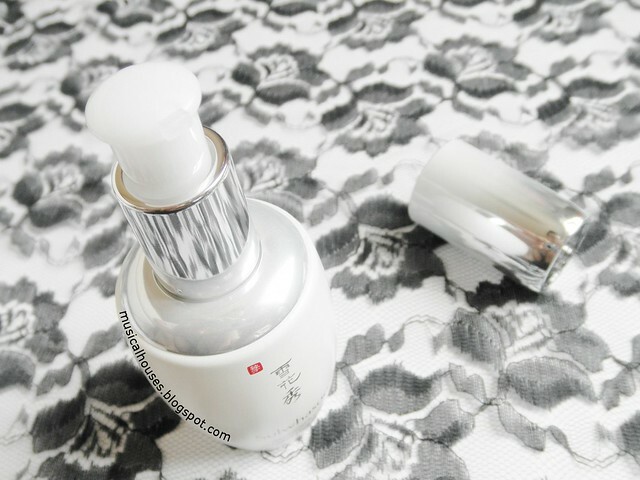 So, would I recommend the Sulwhasoo Snowise Brightening Serum? At S$268 for a 50ml bottle, this is definitely not for everyone - certainly not those who are taking a budget approach to skincare! 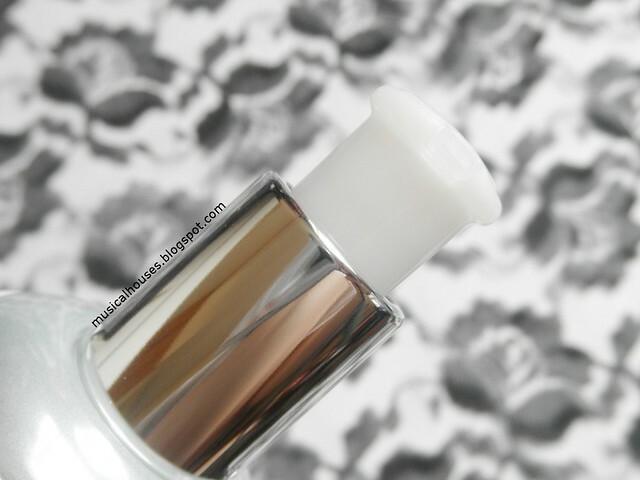 But if you don't mind the splurge, then the Snowise Brightening Serum does live up to its promises of being a whitening product based on a variety of Asian plant extracts and ingredients. This could be one to check out, particularly if you like a brightening, anti-aging product, or if you like unique and interesting plant extracts with promising skincare benefits. The Bottom Line: Despite the price point, Sulwhasoo's Snowise Brigtening Serum contains a variety of Asian plant extracts, with brightening, anti-oxidant, and anti-aging properties. Don't I absolutely hate analyzing Sulwhasoo ingredients with their 50 unknown extracts I have to research! Haha! :D There's usually no proof the vast majority of them are effective in skincare anyway. It's disappointing that alcohol is so high up, this seems to be a trend with Sulwhasoo. I have the First Care Activating Serum and I was expecting so much more than what it did, especially considering the full price. This one really doesn't seem to be worth the money from the ingredients list and I am not even tempted to order samples. @Felisse: It's a pretty lightweight product, so I'm not sure how well it will work as a moisturizer - perhaps if you have oily skin and live in hot weather, and are looking for a super-lightweight gel moisturizer, then this might work. But it doesn't have the traditional creamy emollient texture of standard moisturizers. Hope this helps!